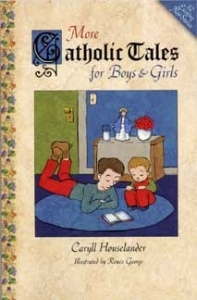 Here are stories of princes and gypsies, bishops and bears, tales of Catholic boys and girls that remind us that especially in young souls the faith is quite strong, and evil is never a match for goodness. Among others , you'll meet: Bernard, the boy who walks three miles to school and meets Christ on his way; Nickie, the young prince who learns from a dancing bear a strong lesson in love; Tommy, who uses kindness and two minnows to heal a bishop and save a school; Osbert and Rupert, gypsy twins wo make a donkey of themselves to bring peace to the world; Joey, the stable boy whose coat is transformed when his donkey bears Jesus to Jerusalem; Kathleen, who goes withut candy and brings a shopkeeper back to the Faith and many more . 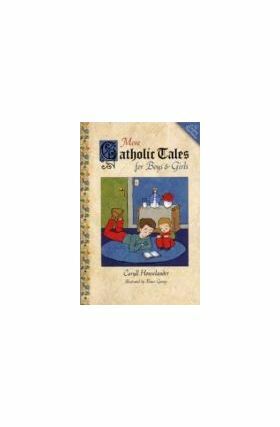 . . Soviet cows, Marian icons, pet mice, Easter roosters, Noah and the ark, fish, donkeys, and even a dinosaur: they're all here in a dozen charming tales of children living their faith while having great Catholic fun!